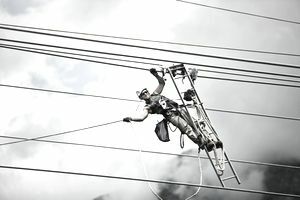 According to the U.S. Marine Corps, the job of a Marine Corps electrician or 1141 includes installing, operating, maintaining, and repairing electrical power distribution systems, whether those systems are underground, above ground, and overhead. Electricians also operate and perform organizational level maintenance on electrical power generation equipment, load banks, and floodlight sets. When they're on Military Operations Other Than War, or MOOTW, they install and repair interior wiring in buildings. An electrician's duties include installing hardware including cross-arms, insulators, and lightning arresters. He might also assemble or erect and climb utility poles or towers and string wire conductors. He would be charged with measuring, cutting, bending, assembling, and installing electric conduit. He might be charged with installing control and distribution apparatus such as switches, relays, and circuit breakers, or testing circuits for continuity, compatibility, and safety. Circuits can include ground units and those of components. The electrician would typically use test instruments such as multimeters and ohmmeters and install and repair electric fixtures. Non-commissioned officers are afforded the opportunity to attend the Advanced Electrician Course that provides in-depth instruction on the requirements of the National Electric Code and the planning of electrical support. This includes determining demand, phase balancing, and voltage drops. An apprenticeship program that leads to U.S. Department of Labor certification as a journey worker is available to electricians under the United Services Military Apprenticeship Program, known as the USMAP. The USMAP is an official military training program that offers Navy and Navy Reserve full-time support service members the ability to improve their job skills and to complete their civilian apprenticeship requirements while they're still on active duty. The U.S. Department of Labor provides the nationally recognized "Certificate of Completion" when the program is complete. The USMAP affords military participants with an opportunity to enhance their job skills and show motivation for more challenging military assignments. Having a DOL Certificate of Completion often proves to be a significant advantage in obtaining better civilian jobs because employers know the value of these apprenticeships. You must not suffer from acrophobia, a fear of heights. You must first complete the Basic Electrician Course (M0.311B2) at the Marine Corps Engineer School in Camp Lejeune, North Carolina. You must have normal color vision. Refer to MCO 1510.96A Individual Training Standards, for a complete listing of duties and tasks.